Teachers spend far too much time entering grades. For example, a district with 35,000 students sends an average of 50,000 results per week to the student information system (SIS) or gradebook! Thankfully, there are several paths to make posting learning data less arduous for educators, and we've implemented it with hundreds of districts already. Watch Kimono's short demonstration of how grade passback works, sending assignment grades from Canvas to the SIS (shown with PowerTeacher Pro). Grades have been part of the SIF spec since SIF2 was released in 2007, but Kimono was one of the first to work out a usable choreography and successfully share learning data using SIF. Kimono is passing several extended elements, such as "Excused" and "Late" to enable a more holistic view. OneRoster v1.1 includes horizontal grade passback and grading categories, line items (or learning activities), and results. Grading categories and line items allow educators to assign weights to activities, such as test scores, assignments, participation, homework, quizzes, etc. Results are the union of student effort against line items. Sharing learning data is also possible via APIs and CSV. 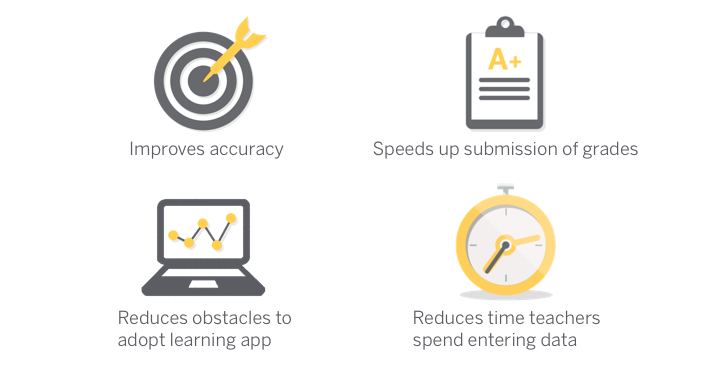 No matter which method used, the Kimono Grades App is saving educators a tremendous amount of time. Reach out to us and find out how we can help you take your data integrations further.